AccessLex Institute is committed to understanding the barriers that impede access to law school for historically underrepresented groups and improving access to law school for all; identifying actionable strategies and public policies to increase law school affordability; and strengthening the value of legal education. Through our academic and bar success programming, outreach, publications, research, and grantmaking, we seek to materially and measurably increase levels of student success in and beyond law school. A primary focus of this mission includes increasing first-time bar exam passage nationwide. 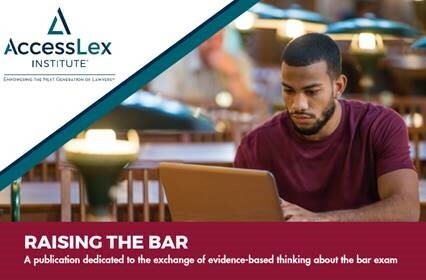 Raising the Bar, a newsletter dedicated to the exchange of evidence-based ideas about the bar exam, was launched in October 2018 and features distinguished commentaries, recent bar-related publications, information about research grant opportunities for scholars and bar scholarships for students, upcoming conferences with bar-related sessions, Academic Success Program (ASP) and organization program profiles. Please send information for possible inclusion in upcoming issues of Raising the Bar to success@accesslex.org. The Bar Success Research Grant Program supports well-designed studies of the bar examination. Examples of study focus include effective predictors of bar success, bar exam test design and/or efficacy, and successful study methodologies. Proposals focusing on other relevant aspects of the bar exam are welcomed. We are particularly interested in proposals that seek to inform efforts to increase passage rates among populations most at-risk of not passing on the first attempt as well as proposals that are designed to yield findings that are scalable and replicable. For more information or to submit a proposal, visit our Bar Success Grant Program webpage. The Inaugural Bar Research Forum in Washington, D.C.: In April 2018, an historic gathering of leaders, thinkers and educators shared ideas about bar exam issues from differing perspectives within the legal education community. This was an unprecedented convening of law school administrators, doctrinal faculty, bar regulators, exam designers and academic support professionals whose goal was to identify research necessary to both improve the bar exam itself and to increase bar pass rates. Regional networking events were hosted in Chicago, New York and Washington D.C. in 2018. AccessLex will convene similar programs throughout the nation in 2019. AccessLex sponsored the Association of Academic Support Educators (AASE) annual conference in St. Louis in 2018 and will sponsor the AASE conference in Seattle in 2019. Contact us at success@accesslex.org if your law school is interested in hosting an upcoming regional networking event. Visit our event sponsorship page to learn more about sponsorship opportunities. AccessLex research analysts are working on internal research studies as well as with organizations and institutions to assist in analyzing data that will inform changes in academic and bar success intervention efforts. Contact us at success@accesslex.org to propose collaborative projects and be considered to receive assistance in your research and/or data analysis efforts.